service in Arizona and you are all a part of that! It’s time to share your memories and stories! Submit your favorite memory here and enter to win! Grand Prize: A Trip to Mexico for Two! As a former employee, I have a deep catalogue of fond Macayos memories from the good ol’ Depot Cantina. I spent some of the greatest years of my life serving that classic Mexican cuisine, forming some of the strongest friendships of my college years that will last a lifetime. Not only did Macayos help put me through college, but the five years I spent serving there gave me many memories that have forever warmed and enriched my soul, none more so than the day I met my future wife. Her first day was a Tuesday. As a new server in training, I couldn’t help but be distracted by the bright and vibrant new Macaw flying into the Depot Cantina “bird cage.” Her name was Aimee. I stumbled through an awkward introduction of my own name – an embarrassingly pathetic ice breaker that still brings us many laughs to this day – and an unbreakable attraction began. That day was six and a half years ago. We have been making each other laugh every single day since, and are set to marry each other next spring. Macayo’s was the mutual connection that brought us together, and it will forever hold a special place in our hearts as the place I first told her my name. I have been coming to Macayo’s since 1954 when I was five years old. I would come with my parents and celebrate every special occasion there. We knew Woody and always enjoyed talking to him. In late 50’s my parents, Bud and Evangeline Fairall, won a trip to Acapulco. This was a special treat because they had no money for a real vacation. They came home talking about the wonderful trip and how they met Richard Burton ad Liz Taylor at the Mexican resort. The fun news was that the resort had to close the pool when Richard and Liz were using it for their fights and love making. Macayo’s made this free trip experience a great topic at all family events. Thank you Macayo’s for your generosity, memories, and always having the best Mexican food. The picture is me and my wife, Carol, at Macayo’s celebrating the 5th anniversary of her liver transplant. It would be wonderful to take her on the special Mexico trip like my parents took a long time ago. Always going there was my favorite Memories , but the best of all 26 years ago the one on Central Ave…. I met the best waitress her name was Cici or Gordy… loved her and always wanted her section … then in 1989 worked with her at La Piñata lol and I asked her to become my son’s godmother and the rest is history . But I always loved your food and Macayo’s was also the first Mexican Restaurant that we first went to in 1968 coming from Niagara Falls, New York. And faithfully at least 4 times a month after that and also my dad owned a carpet store right around the corner, so we would walk there. My first memory of Macayo was of the Woody’s restaurant at 51st Ave and Indian School, in the late sixties. My dad was the Pepsi-Cola salesman and later sold dairy to your chain, and he knew Woody for years. Sometimes when our family went in for dinner, Woody would comp the meal for our family. This was a wonderful favor to a family living on one income, with my mother being sick with COPD. We couldn’t afford dinner out very often, and it meant she didn’t have to cook.Thank you for that gift! We had burros with green sauce most often, but what we kids liked most were the hot chips and pico de gallo salsa. In fact, when I lived in California during university, and for 12 years another time, there was no salsa that could compare with Macayo salsa–it was boring old hot sauce, not your pico, with sweet, juicy tomatoes and sharp onions and cilantro. When I’d drive back to Phoenix to see my parents, it wasn’t only the salsa that called our names. We loved your chimis, too. In California, the restaurants put (gasp!) rice or refried beans in as filler. Oh, the horror. And if you ask for Norteno style, the server looks at you blankly, as they do when you ask for a green chili burro–they think you’re ordering donkey meat. Ha! Gracias, Woody. Fifty years, and we remember! Macayo’s has become our special place. November 13 2008 we got married at the Surprise Court house and then our family all met at Macayo’s for dinner. We were young and in love and didn’t have a whole lot of money for a giant wedding but they gave us the private room with the twinkling stars on the ceiling and it made it feel very special, ill never forget it. We now celebrate all of our anniversaries there and will be going there this coming Sunday for our 8 years. Both days we found out we were pregnant with our now 6 year old and 1.5 year old we celebrated at Macayo’s. I do not have a picture for this memory but it is one that turned into 2. 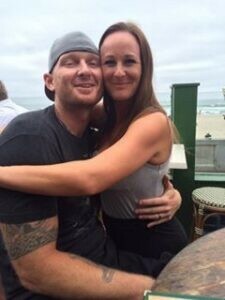 My husband and I had our first date at Macayo’s in Glendale and I knew from that night he was the one for me. 2 1/2 years later we had our rehearsal dinner at the Macayo’s in Tempe. Both nights are so memorable to me because they are 2 of the best times in my life. 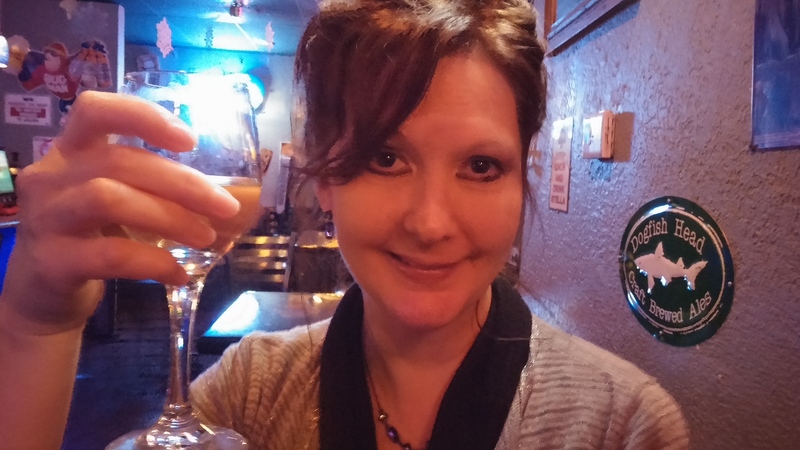 On Feb. 23, 2002, my husband and I met through mutual friends at a Macayo’s on Central Happy Hour. A week later, we went on our first date, and have been inseparable ever since! Macayo’s holds a very special place in my heart. My mom, Linda Anderson opened the Mesa Macayo’s when I was about 2 years old and worked there for about 10 years. I am now 36 with years of amazing and fun memories.When I say I grew up in this restaurant, I really did! 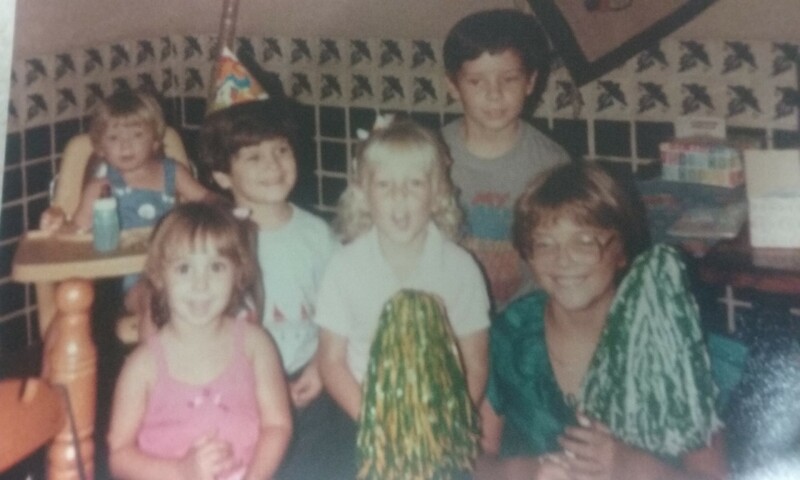 Some of the best memories are when I was running around the kitchen at closing time and all my moms friends would just laugh at the little blonde girl having a blast! I remember hanging out in the mangers office with Donna and eating ice cream and coloring, the best! When I was little I had birthday parties there, and as an adult I still have my birthday dinners there. When I turned 18 I was away from home at school, my mom, the most AMAZING mom, surprised me by over-nighting my favorite Macayo meal in dry ice, the # “101” and 18 roses. THAT was so awesome. There was a time or two when I had moved out of state and the last thing on my list before leaving was to buy many cans of the Macayo’s red enchilada sauce, I NEVER make enchiladas with out it. Macayo’s food is truly amazing and my favorite,thanks to my mom I am addicted and love it! My memories continue to this day, in fact, Macayo’s was with me two months ago on a very special day. My mother is my best friend, my whole entire world and we have always been VERY close.On October 18th, 2011 my world was turned upside down, my mother was in a tragic car accident and died of severe brain injuries. I went through the worse time of my life, trying to learn how to live without my best friend. It was a long road but finally and thankfully I met an amazing man who changed my life. He asked me to marry him on January 1st of this year and instantly I knew where I wanted my reception to be, the place where my mom is close to me and I know will be right there with me, at Macayo’s. Thank you Macayo’s and the amazing crew at Mesa, I had the most BEAUTIFUL reception.And thank you Macayo’s for keeping my mothers memory alive when I am at my favorite restaurant. Before my mom passed away she wanted to go out to eat all the time, we would stop at Macayo’s on Central for an early bird dinner at least once a week. She loved the cheese enchiladas and fried ice cream. Every time I go there, I walk past the table that we sat at the most often, and I remember the many dinners we had there. I will definitely miss this place when it’s gone. When I moved to Arizona back in January of this year, I was missing the great Mexican food from home (in Illinois). I am half Mexican and I wanted something that tasted like my childhood and my grandmother’s cooking. 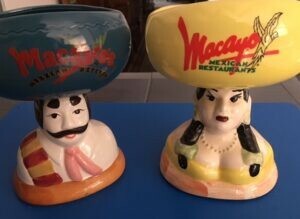 My girlfriend suggested that we go to Macayo’s for dinner, she swore that I would love your food…Boy, was she right!!!! I ended up getting the carnitas dinner plate and it reminded me of Saturdays with my family. Since living here in Arizona, my girlfriend and I eat their once a week for our date night. You have amazing margaritas too!!! I have tried almost everything on your menu. Winning this trip would be amazing!!! I am the only one in my family that hasn’t been to Mexico. I would love to see where my father’s side of the family are from. I want to experience the culture and history of this country….also the food!!! Thank you for being the best Mexican restaurant in Arizona and letting me re-live my childhood memories!!! Grew up in Maryvale going to Woody’s. My mom had a good friend who worked there named Lilian. She bowled with my mother at the Maryvale bowling lanes. When I was pregnant with my 1st son ate at Woody’s. My beautiful friend came From Pennsylvania and this was the only place we would get together. 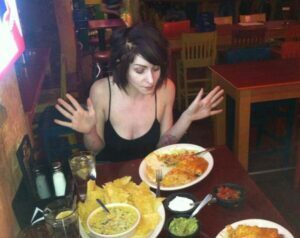 We laid her to rest but we kept coming to Desert Sky Macayo’s because that is the last place we got together with her. 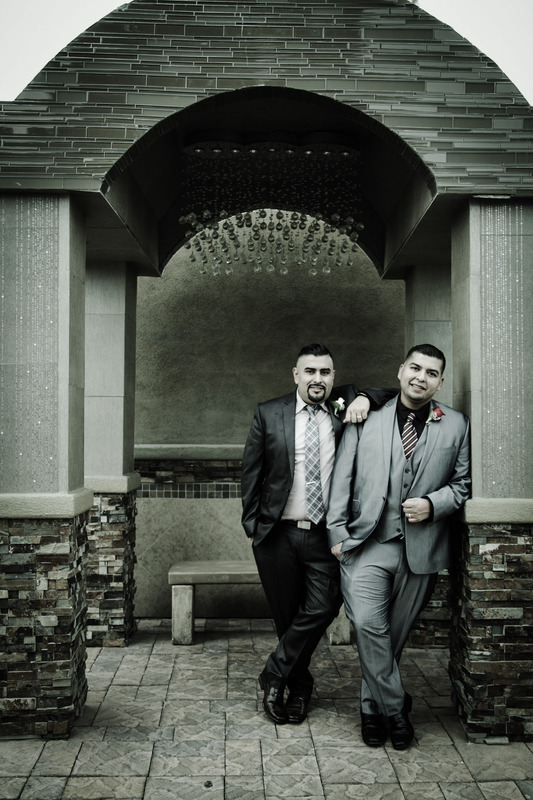 We have been patrons for years and years and love the atmosphere, the people and the food. Countless memories are built around this Macayo’s. First the one on Central and then when you moved this one close to us. Thank you Macayo’s now I’m hungry and have to hit your restaurant before work tonight. As you can see we have Bob Bob and Cha Cha with us and I still have them in my cabinet. I’ve had so many special moments at Macayo’s over the past 35 years. I grew up in AZ and Macayo’s was a family tradition for us. Every Christmas Eve we would head to Macayo’s, we still do today! 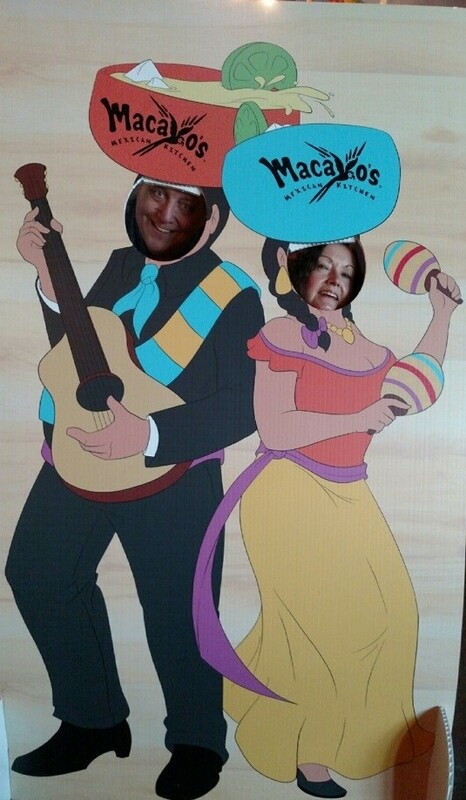 My wife and I had our first date at Macayo’s in Scottsdale Rd. 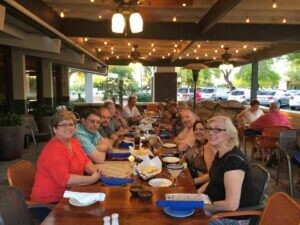 We also had our rehearsal dinner for our wedding at Macayo’s. We’ve catered Macayo’s for over 10 special family birthday’s, for a going away party when my wife and I moved to TN for a few years, Superbowl parties, Christmas parties and much more. When my mom & dad moved to Prescott we were so happy that Macayo’s followed (please come back!). My wife and I have visited all of the Macayo’s locations including Las Vegas. 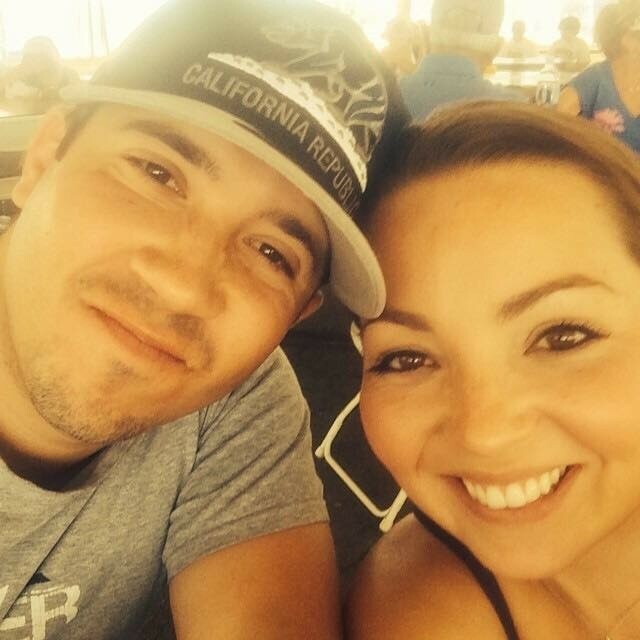 My favorite memory that my wife and I laugh about was the day my 2nd oldest son was born. My wife was in pre-term labor and he was taking a while to come into the world. Family had come to St. Joseph’s hospital and they all decided to head out for lunch. Where else but Macayo’s on Central! Of course they asked if they could bring me anything. I ordered my second favorite meal the Enchilada Sampler (a.k.a. the Mexican Flag). Right as I finished the meal a nurse came running out and said I better get in the room. Within 5 minutes my son Aidan was born. You’d never believe what one of his favorite places to eat is? That’s right… Macayo’s!! Anything with Baja he says! Macayo’s – our family tradition for 35 years and many more to come! I can remember when Macayo’s was a tiny rest. On 51st Ave and Indian School. It was a special night on Tues. When my mom would take me to eat there. I have so many great memories with Woody’s Macayo. I grew up eating at Woody’s (as we called it) located on 51st Ave & Indian School Rd. Of course this location was closed when they opened the Desert Sky location. I was taken there as a baby…even before able to sit in a high chair. I have taken my grown children to Macayo’s since they were born. And my grandchildren have also grown up on Macayo’s. In fact since my 32 yr old moved to Nashville TN 2yrs ago. We have to ship her Macayo’s hot sauce. For her bridal shower here in AZ. Everyone was required to bring a bottle of Macayo’s Hot Sauce. There are so many memories with Macayo’s. From family birthdays to mother & daughter’s day out or out with all our neighbors. Joe the manager along with many of the waitresses were family to us. In 1997 my mother fell off the roof of our house. My father was roofing the house. She went up to take tea to the workers. When she was coming down the ladder slid & she fell. Hitting her head. She suffered head injuries. She was bleeding on her brain. 15 hrs of surgery and 15 days in a drug induced coma. While Dr’s tried to get us pull the plugs on her. She woke up! She was like a new born baby. Couldn’t talk, walk, eat or even hold her head up. But she was alive! Knowing my mom loved her Macayo’s food..I had to find a way to get her some. I called Woody’s and talked to Joe the manager. I had explained what had happened etc. My mother loved her green chilie burros. But couldn’t chew good enough for it yet. I asked if they could help me? Making her a special green burro. One with ground beef instead of the chunky meat. They not only made her a special burro but added other items I could feed her. On top of all this kindness. They refused to let me pay for anything. And sent extra food for my father and I. The next day she received beautiful flowers from her family @ Woody’s!! This I will never forget! Months later her 1st outing in her wheelchair was to Woody’s Macayo. 55 yrs of love! My husband, 12 year old son & I celebrated Cinco de Mayo at Macayos’s on Broadway in Tucson Arizona. The food, events, music & service were wonderful. The highlight of our evening happened during the “Jalepeno Eating Contest”. My son insisted he could compete with the grown ups. We were, of course, skeptical. They older contestants were very encouraging & gave him a few pointers. After 4 jalapeños, my son realized he “Bit Off” more than he could chew. His little face was bright red; his eyes were watering & he could barely breath. He finally gave up. The other contestants gave him high praise. They patted him on the back & gave him tips on how to stop the “burning” sensation he was experiencing. We were so proud that he went as far as he did. When I go into the Macayo’s in Casa Grande, it amazes me that even if 2 months goes by, they remember when I come in and make me feel like one of the family. It’s such an awesome feeling…thank you Casa Grande Macayo’s staff! That time when Caylee took a nap on my lap while we ate dinner at Macayo’s and I dropped crumbs in her hair! She really wanted a cheese crisp but just couldn’t keep her eyes open after a long day of running errands. We have so many! We take our grand kids to dinner at Macayo’s often and they love the balloon man and the build your own taco kids meal. We order catering for holidays and graduations, parties, etc. One of our favorite places to eat! 2007 on Thanksgiving Day. Wife, Kathy, son Brian, & his now wife Kristen, spent a week in Tempe. Around 11:00 a.m., we were walking by Macayos and didn’t know if they were open or not on the holiday. We walked onto the patio & Jeff Rhodes recognized us from years past. He said he would gladly serve us, but they weren’t actually open yet. We ordered some beers & he graciously gave us chips & salsa while apologizing profusely that the kitchen was actually not opened yet but would be opening later. While sitting at the patio bar, some other people walked by & saw us. They assumed Macayos was open for business & lo & behold, more people walked in. Jeff looked at us & said, I better go call & get my kitchen & wait staff in earlier than scheduled. On subsequent trips, we are now known as the “Thanksgiving family.” When we tell this incident to the current bartenders & waitstaff that weren’t there in 2007, they look at us & say, “Oh, you’re the Thanksgiving family that Jeff opened up early for on Thanksgiving. Now when we visit from NC, Marcos, Big Mike, & Ben treat us like family. This day was special for my 83 year young Mother. We got to share lunch eating Mexican food at Macayo’s. Mom doesn’t get Mexican food often as my Dad cannot handle spicy foods. We were going shopping at the Luke Air Force Base Commissary, time we spend together once a month, to do our monthly grocery shopping. We live so far away from the big city and this is the only special time we have together to enjoy lunch as Mother and daughter. Macayo’s is our favorite place to eat and Mom was so excited to get to eat Mexican food at Macayo’s. She saw the restaurant and made me stop right away. I have never seen her so happy to get lunch. We enjoy this special day each month with each other and we would spend our lunch at Macayo’s than any other restaurant. Upon moving to AZ 3 years ago, it was my birthday a few months later. Where to go when you’re new in town and want good Mexican food? I had heard that Macayo’s was among the best. I was not disappointed! My daughter and I had a delicious meal that helped to make my first birthday celebration in a new town that much more special. It will always be a wonderful memory for me. Thank you for this, Macayo’s! 3 years ago my son enlisted in the Army. The hotel used during processing is across the street from the Macayo’s on Central. I thought my son and I had said our goodbyes but I got a call from him letting me know he had a few more free hours. I was in a movie theater across town so I left and raced to the hotel. We had enough time to walk to Macayo’s and spend some very special time together before he had to leave. 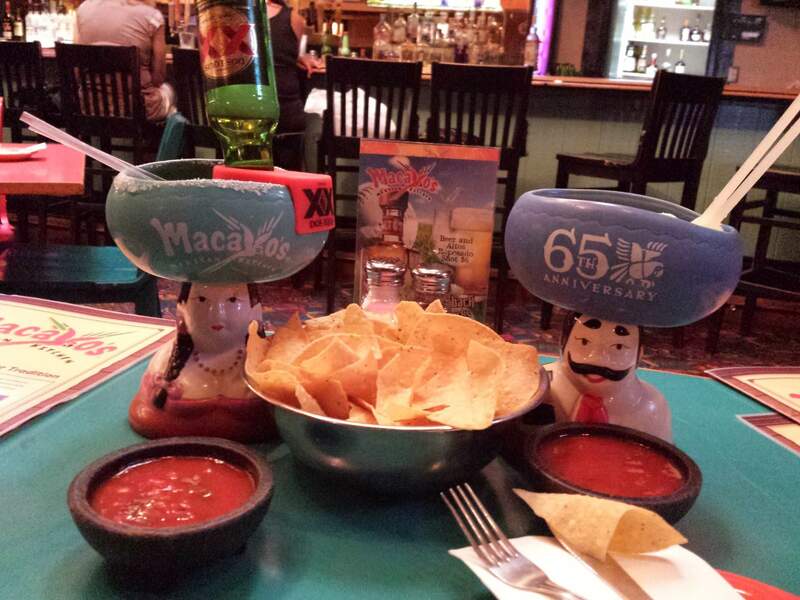 Macayo’s has long been a family favorite; we’ve been going to the Central restaurant and Depot Cantina for years. I always get the same thing – cheese crisp, green corn tamale with Baja sauce and a cheese enchilada. The great news is that my son is back and we’ve had the opportunity for a few more trips to Macayo’s. 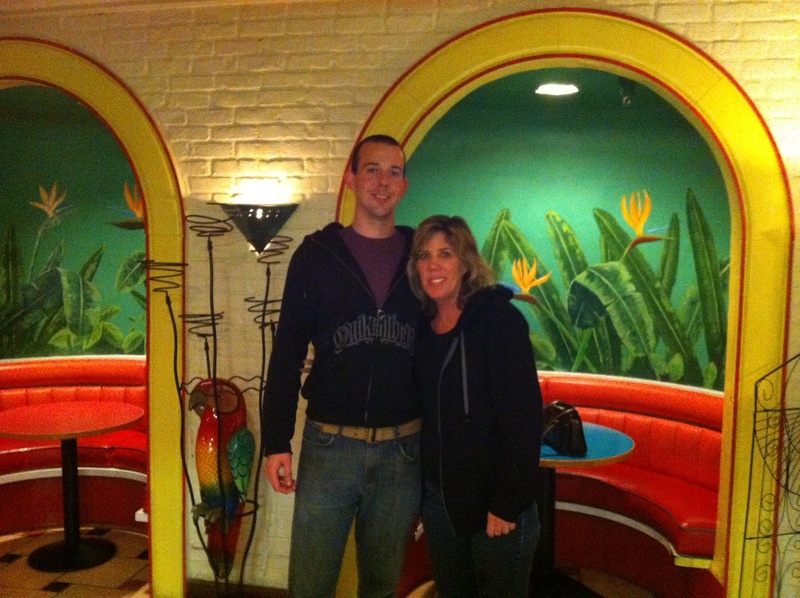 My best friend and I have been enjoying going to Macayo’s since we were kids, so for about 20+ yrs now. 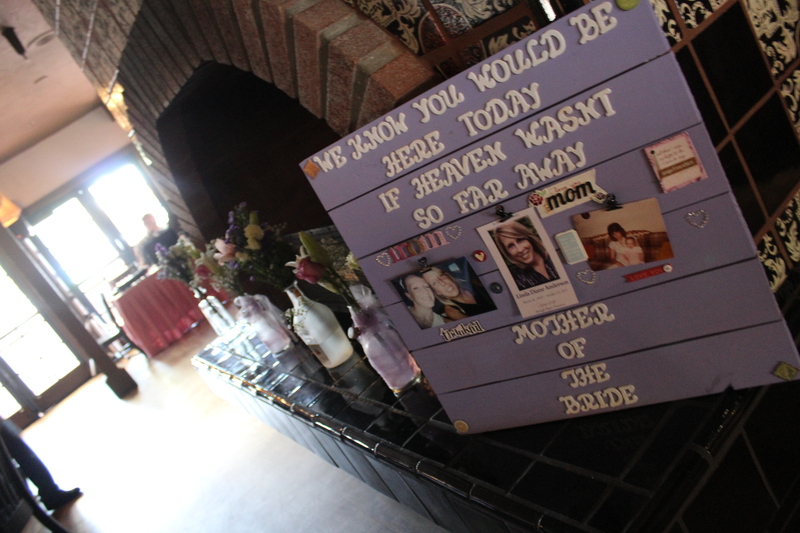 I have too many memories to name just one, but I’d have to say it was when I was pregnant and my husband was deployed. The Mesa location had a manager named Lisa, who always took care of me: she asked me every time how my husband was doing, how I was doing. She has since moved on, and my daughter is now 13. There are still some servers who say to her “I’ve known you since you were in your Mom’s belly”. Macayo’s to me is home. Macayo’s has been there through a deployment, a birth, a few passing of my loved ones. It’s still the place where my best friend and I meet to catch up once a month. Thank you for being a part of my life, Macayo’s. My favorite Macayo Memory is the very first time I visited a Macayo’s Restaurant. Woody’s El Nido was on McDowell Road in Phoenix just off of Central Avenue across the street from the telephone company. It was a Saturday in 1966 and I was at work in west Phoenix while attending ASU. Two friends of mine who were also attending ASU and were from Phoenix suggested Macayo’s for lunch. They recommended the Green Chile chimichanga enchilada style and I have been hooked ever since. I remember going to Woody’s on McDowell just west of Central when I was a kid. Macayo’s has been a part of my life as long as I can remember. My family started going to Macayo’s at the n/e corner of 51st Ave & W. Indian School Rd in Phoenix,AZ before the restaurant relocated to Westridge Mall now known as Desert Sky. We moved to AZ in 1959. I can close my eyes and have fond memories of my loved ones who are now deceased, enjoying great food and happy times together at Macayo’s…all these years later still a CUSTOMER!! I moved to Scottsdale when I was 10 in 1983. 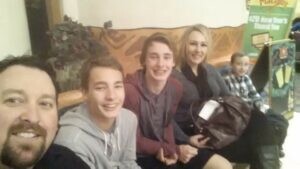 My family went to the Camelback and Scottsdale Rd. Location every Friday. Kathy was our waitress there. My favorite was the mud pie. 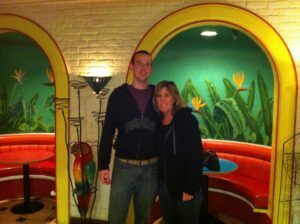 At ASU we frequented Depot Cantina and have many fun memories from there. Now, 30 some years later, I still love the chicken chimichanga and mixing the hot and mild salsa. My birthday is on Cinco de Mayo. My mom is on May 2nd. She went out to eat and celebrate her birthday when her water broke…I was supposed to be born in April, but held out until May 5. I have celebrated at Macayo’s every year for my birthday, except for when I went off to college in New York. When I was little, I used to think all the Cinco de Mayo festivities were for my birthday. As I got older, I learned about the history. It was always fun having piñatas, face painting, mariachi, and more. So many good memories. Number one fan of the Baja sauce. I remember coming to Macayo’s when I was a child with my parents. Still to this day I take my own family here for celebrations and more memorable moments. Thank you Macayo’s! We had just moved into our brand new house with limited furniture, not even unpacked. My grandmother Sherry comes to visit and after we show off the house we decide to go eat out. I had two boys at the time ages 4 and 2. So we go and as usual we start with chips and salsa. My 2 year old started eating some chips and wanted to have some salsa. We were uncertain but figured we’d let him try (with water ready in case it was too spicy). Well after one bite his eyes lit up and he just dug in. So we learned that my two year old Ian loves spicy foods and especially your salsa. He ended up leaving with a river of salsa running down his shirt because he just loved it so much. He was the happiest baby that day and to this day loves your salsa. He’s now 14 years old and still loves spicy foods, and it’s our favorite family restaurant up here in Surprise. I wish I had a picture to capture the many memories of your old Camelback location!!!! I moved here when I was 16 from Wyoming.. moving to Scottsdale, AZ while a Junior in High School was the hardest thing I have ever done. But I am so thankful for it! I met Betsy in Spanish class in High School and we have been friends ever since! Macayo’s was her favorite restaurant and she took me there many times; Friday nights, after school, and Sunday lunches! I fell in love with your salsa and food. Betsy as since moved to Texas but every time she comes home to visit we make Macayo’s a part of her homecoming. We are always at home with you while eating chips and salsa!! Short and sweet memory, yet so huge in my heart!! 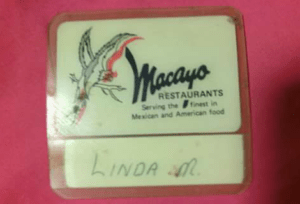 Over 25 years ago my parents would take us out to eat at Macayo’s on Dobson in Mesa. I would always get a single cheese enchilada because it was less expensive than a meal so that I could convince my dad to get the deep fried ice cream! We would also go with our neighbors and eat upstairs in the cantina when I was about 8 years old. My best friend and I would constantly ask our parents for quarters and go downstairs to play Mrs. Pac-Man. Since they were having happy hour, they kept giving them to us to keep us occupied. We eventually learned that we could play the game while taking a couple of bucks home in our pockets in quarters! Last best memory is my 95 pound grandma from Ohio would come and visit and eat an entire chimichanga! Any other meal she would eat like a bird. She just LOVED them! 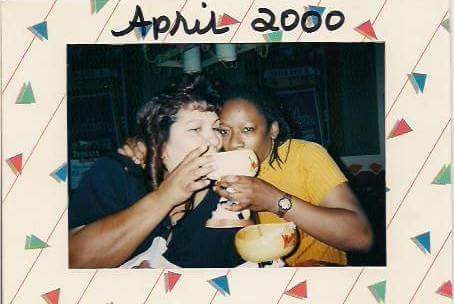 I also remember my mom having to bring her Senorita Margarita glass with her every time we came! Good times!! Born and raised in Arizona my family’s favorite has always been Macayo’s! The key for us is the constant consistency! As we get older, my twin and I have grown in our own ways, add husbands, kids, and jobs in the mix and you could say we are pretty busy! But one thing always stays the same, our monthly Macayo’s outing! Our tradition? First week of the month, Spinach Con Queso, 2 chimis, and the time we need to catch up and keep track of what’s new in each others lives! My 22nd Birthday was at Macayo’s in Tempe on Jan. 22, 1998. I met a man that night and now 18 years later we have the most beautiful 17 year old daughter. I’m so blessed my friends gave me a surprise party that night. My life changed forever! We still frequent the Macayo’s in Tempe. The family favorite are the mini chimis and the Baja Chicken enchiladas! When my wife and I travel to Phoenix & Scottsdale from Fresno CA. I always bring my Senor Bob and Cha Cha mugs to enjoy your margaritas with dinner Its only a 606 mile trip for 9 and a half hours non stop. Macayo’s is the only Mexican Restaurant we go to..
My first time at Macayo’s restaurant was in early 2015 with my now boyfriend. He told me we had to go to the nearest Macayo’s to our house at the time, or I would basically die from missing out on some amazing happy hour specials and great food. We were instantly greeted with smiles and awesome hospitality, our hostess sat us at this booth and our waitress immediately came over to greet us and help us out with the menu. I had just turned 21 a few weeks before, so I was still experimenting with new drinks to try. Our waitress had suggested a drink off the happy hour menu that had liquor, and once she brought it out, I had fallen in love with the looks itself that I didn’t want to hurt the drink’s beauty by drinking it! I did anyways, of course, and it was delicious. We had then ordered our food recently after, and after less than 20 minutes later, our food came out and it was fresh and delicious as well! We left a generous tip for our lovely and helpful waitress and the hostess as well for taking the time to help us with the menus and having a great experience all together! Still a favorite popular date night location for us! My favorite memory of Macayo’s is going to my first MS support group meeting. I have multiple sclerosis, and my MS group and pharmaceutical company hosts a dinner and support group once a month at Macayo’s on Central. It led me to find a wonderful neurologist to treat my disease. I have also made many friends during these events. Macayo’s really takes care of the guests. The food is always amazing. Chips with tons of dips! Fajitas..carnitas…and other great food! Even a great dessert at the end. I’ve gone to Macayo’s several times before being a part of this MS group…but these times are definitely the most meaningful for me. We love Macayo’s! My favorite Macayo’s memory is from September 8, 2007, it was the first date I ever had with my now husband. I remember the day like it was yesterday. The weather was perfect and we arrived at the same time, Macayo’s definitely set the setting for what would be one of the greatest most memorable days of my life. I ordered a chicken chimi and he orders the tacos. Our waiter was so attentive, music was great, drinks were ice cold, and the food was amazing. To this day we will still visit the Central location on our anniversary date. Thank you Macayo’s for making this memory one I’ll never forget. Contest will run from Saturday, October 15th, 2016 through Wednesday, November 30th, 2016. All submissions will be reviewed by our Macayo Senior Executive Team. Winners will be selected on Thursday, December 1st, 2016. Winners will be notified on Friday, December 2nd, 2016. Grand Prize: A Trip to Mexico for Two! And, a Macayo Prize Basket! – Winners will be able to select a weekend of their choice. 3rd Place Prize: $100 Macayo Gift Card! Just submit your story! You never know what we’ll reward you for just entering our contest! By entering the Macayo Memory Contest you are authorizing Macayo’s Mexican Restaurants to add you to VIP E-Club where you will receive exclusive offers, discounts and Macayo News before anyone else! Also, by submitting your entry above, you are authorizing Macayo’s Mexican Restaurants to share you story on Macayo’s Mexican Restaurants’ social media channels. First Name, Macayo Memory and Picture (if included) would be shared with our followers across our social media channels. 1. Prize(s). The prize(s) that may be awarded to the eligible winner(s) are not transferable, redeemable for cash or exchangeable for any other prize. All prizes must be claimed from the Macayo’s Mexican Restaurants within thirty (30) days of the contest end date unless otherwise stated in the contest’s official rules. A Macayo representative will contact you to set up collection or mailing. Certain prizes are date specific (i.e. trips) and the winner or winners must be available on the dates specified. If a winner cannot be contacted or is disqualified for any reason, Macayo’s Mexican Restaurants reserves the right to determine an alternate winner or not to award that winner’s prize, in its sole discretion. 2. Eligibility and Limitations. Participants and winner(s) must be U.S. residents. The age limit will vary from contest to contest as determined by Macayo’s Mexican Restaurants. Employees of Macayo’s Mexican Restaurants, and members of the immediate family of any such persons are not eligible to participate and win. The term “immediate family” includes spouses, siblings, parents, children, grandparents, and grandchildren, whether as “in-laws,” or by current or past marriage(s), remarriage(s), adoption, co-habitation or other family extension, and any other persons residing at the same household whether or not related.